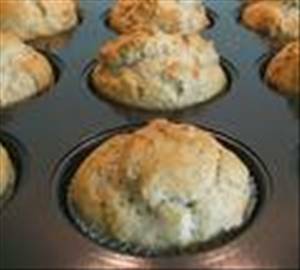 Healthy muffins with banana, flaxseed and whole wheat flour. Preheat oven to 350 °F (175 °C). Apply cooking spray (like Pam) on 2 muffin tins and set aside. In a medium bowl mix together sweetener (like Splenda) for baking, flaxseed meal, mashed bananas, milk, sour cream and egg substitute until well blended. Stir the dry mixture slowly into the banana mixture until moistened (be careful not to over mix). Bake for 30 to 40 minutes in the preheated oven or until a toothpick inserted in the crown of the muffins comes out clean. There are 207 calories in 1 serving of Whole Grain Banana Muffins. Calorie split: 23% fat, 66% carbs, 11% protein.